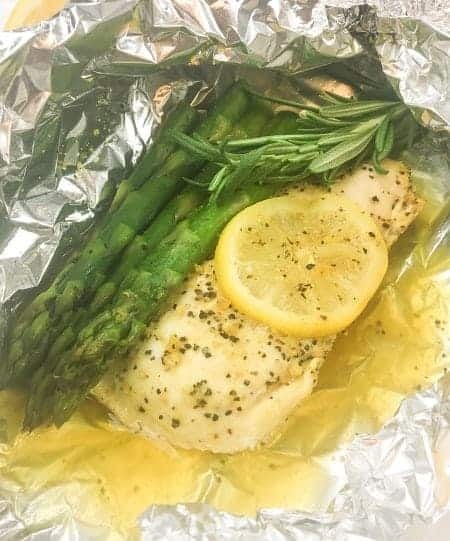 Super juicy lemon pepper chicken baked in a foil packet with fresh asparagus and rosemary. Quick and easy healthy chicken dinner. Low carb and keto friendly. Quick Note: This post contains affiliate links. Please read my disclosure statement for more details. Supper just got a whole lot easier thanks to using foil packets! 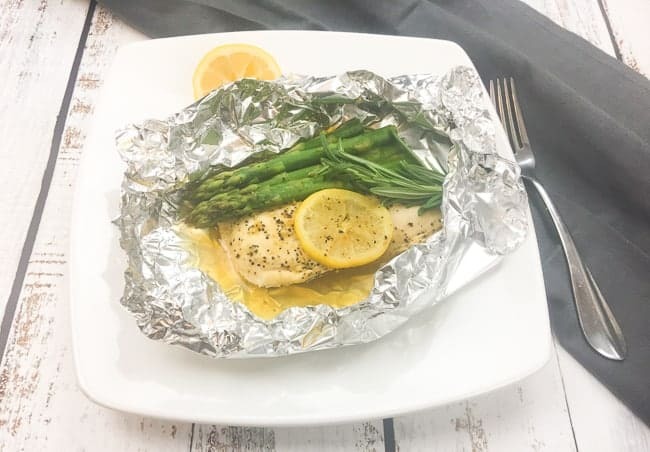 Baking food inside a foil packet is always a great choice as the ingredients steam themselves into a perfectly cooked meal. All the flavors combine and the chicken and vegetables are tender and juicy. Very juicy! And at just 2 net carbs per serving, you can enjoy a delicious meal and stay on your low carb or keto lifestyle without sacrificing flavor. Lemon pepper chicken is a family favorite. And this lemon pepper chicken recipe is a healthy choice for anybody wanting a quick and easy chicken dinner with vegetables. This recipe calls for asparagus but you can also use green beans, broccoli, cauliflower, zucchini, or whatever your favorite vegetable is (be sure to check the carb count when using a different veggie). Use rosemary, thyme, or your favorite mixture of herbs. 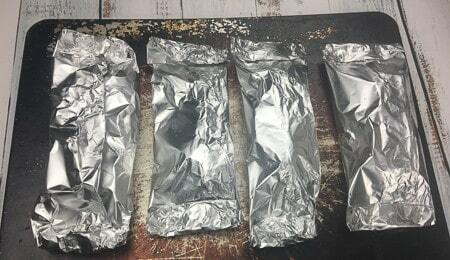 Store any leftover foil packets in the refrigerator; great to eat the next day! According to Healthline.com, asparagus is packed full of nutrients. It’s low in calories and carbs and full of vitamins and minerals. Asparagus is good for healthy digestion and even helps lower your blood pressure. Read the full article here 7 Reasons Why You Should Eat More Asparagus. You’ll need four 5-oz chicken breasts (about 1/2 to 3/4 inch thick). Lay each chicken breast on a 12″ x 12″ heavy duty foil sheet that’s been lightly coated with olive oil or coconut oil. Sprinkle both sides of chicken with lemon pepper seasoning. Place about 4 to 6 asparagus spears in each foil packet next to the chicken. Add a sprig of rosemary and a slice of lemon. Sprinkle asparagus with lemon pepper seasoning. You can add a few sprinkles of fresh lemon juice as well. Before Baking Picture: Chicken breast with asparagus spears, slice of lemon, sprig of rosemary and lemon pepper seasoning on top of foil. 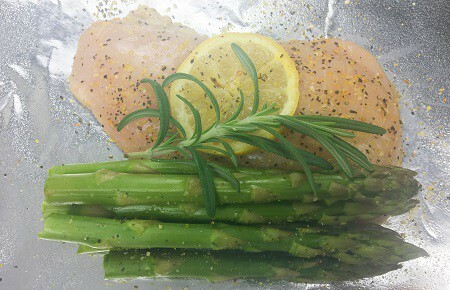 Lemon pepper chicken and asparagus foil packets all wrapped up and ready to go into the oven! Bake in a 400-degree oven for about 20 minutes or until a meat thermometer indicates the chicken is cooked through. Baked chicken with asparagus and rosemary. Incredibly juicy! Look at the juice! Not only are the chicken and asparagus delicious; but the juice is so flavorful that’s why I always slurp it up, lol! Don’t let the delicious juice go to waste! Dip the chicken and asparagus in the juice while you eat it. Tender, flavorful, juicy chicken combined with crisp healthy asparagus. You have to feel good about this one! 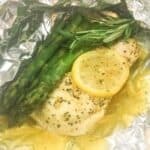 Super juicy lemon pepper chicken baked in a foil packet with fresh asparagus and rosemary. Quick and easy healthy chicken dinner. For each serving: Season both sides of chicken breast with lemon pepper seasoning. Place one breast onto a 12" by 12" sheet of foil that has been lightly coated with olive oil or coconut oil. Add 5-6 asparagus spears next to each chicken breast. Then add a sprig of rosemary and a slice of lemon. Sprinkle a little more lemon pepper seasoning on top of asparagus, if desired. Also, add a few drops of lemon juice on top of the chicken and asparagus, if desired. Tightly wrap each chicken and asparagus packet and place on a baking sheet. Bake at 400 degrees for approximately 20 minutes or until chicken is no longer pink and reaches 160 degrees. Remove from oven and let rest for about 5 minutes before eating. Note: Larger chicken breasts will require longer baking time so please keep in mind and use a cooking thermometer. I hope you enjoy this recipe! Leave me a comment; I’d love to hear from you! More notes: Different brands will vary on the net carbs so keep that in mind. For the most part, they should be fairly close. Use a site like MyFitnessPal.com or FatSecret.com to figure out this information based on the brands or ingredients you used.